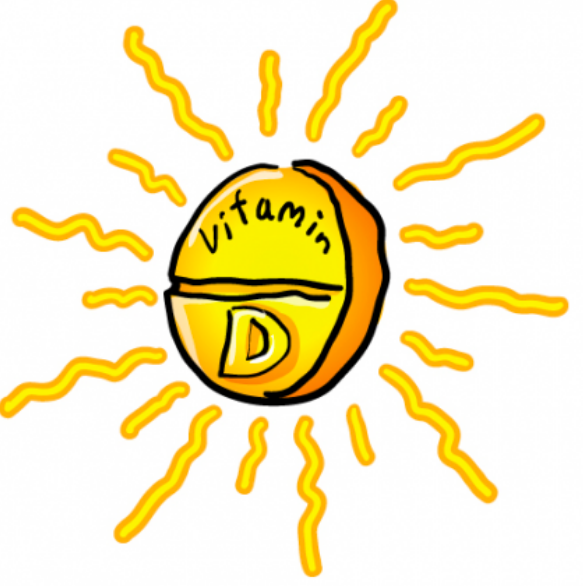 Vitamin D - A Life Saver? Vitamin D has many important functions for our bodies. For example, it regulates cell growth and strengthens our bones. It also stops the proliferation of abnormal cells which prevents us from getting cancer. Scientific studies show that the risk of getting cancer is significantly reduced by vitamin D, especially the colon cancer. Vitamin D not only protects us from getting cancer, it can also delays the ageing of our bodies and prevents us from heart diseases as well as high blood pressure. Moreover, vitamin D can strengthen our immune system and protect us from chronic diseases such as diabetes and multiple sclerosis. By knowing such multiple benefits of consuming vitamin D, you would probably ask how could we get more vitamin D? Our body cells can actually produce vitamin D by themselves. Apart from that, we could also get vitamin D from our diet. About 90% of our vitamin D is produced by our body cells. Exposure to sunlight, more precisely the UV radiation is the source for our body cells to produce vitamin D. Therefore, we actually can produce more vitamin D in the summer than in the winter. We found an interesting article concerning the vitamin D contents in insects and its influences. Although the metabolism of vitamin D in insects and the physiological role of vitamin D for insects are still unknown, the studies found out that insects generally produce lower concentrations of vitamin D in their bodies. The scientists believe that it is because those insects are not exposed to sufficient ultraviolet B (UVb) sources or to sunlight. Therefore, those insects mainly get their vitamin D from their feed. From this result, we notice that we can influence the vitamin D content in our mealworms by various factors including the exposure to the UVb irradiance; the level of the UVb irradiance and the duration of the UVb exposure. This can help us boost more vitamin D content when we are growing our own mealworms at home! D. G. A. B. Oonincx, P. van Keulen, M. D. Finke, F. M. Baines, M. Vermeulen & G. Bosch (2017): Evidence of vitamin D synthesis in insects exposed to UVb light. Scientific Reports 8, 10807. After harvesting, freeze your mealworms in a container fit for freezing for minimum 5 hours. Then boil them in hot water for about 3 minutes, then rinse. Fry chopped onion and garlic in about 5 tablespoons of hot oil. Once they start to get golden, add boiled or dried mealworms and fry together until it all has a nice golden color. After another 1-2 minutes, add 2 beaten eggs and stir well. Then add soy sauce and spices. Chop cilantro or parsley into small pieces and add into the mix. Then take off stove and serve with a bit of the cilantro or parsley on top. For additional fresh flavor you can add butter and a few drops of freshly squeezed lemon. 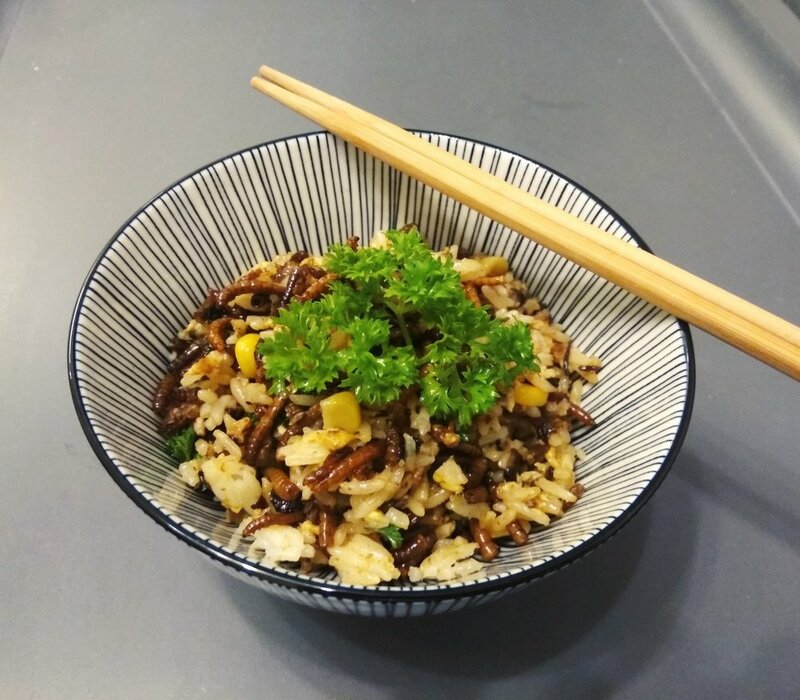 We were enjoying the refreshing Mealworm Fried Rice! Mealworm vs Buffalo Worm- What is the Difference? When presenting our business in public or to investors, we often get the question: “Why did you choose mealworm but not other worms?” This article should explain the differences between mealworm and the buffalo worm. The two species look quite alike but they do have some differences that worth noticing. Alphitobius diaperinus is called by many names. For example, they are called as lesser mealworm; buffalo worm and also litter beetle. It is part of the Tenebrionidae family. The family Tenebrionidae belongs to the order Coleoptera. It means that unlike how their names are indicated, Alphitobius diaperinus is a beetle but not worm. This beetle looks very similar to the yellow mealworm, Tenebrio molitor, but it is smaller. 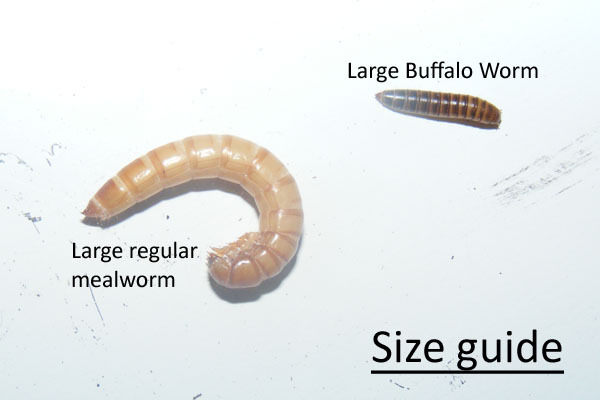 Adult beetle of the buffalo worm reaches a size of 6 mm while the adult of the yellow mealworm reaches a size of 12 mm, so they have approximately half of the size of yellow mealworm. Table 1: Comparison of the life cycle of the yellow mealworm and buffalo worm. 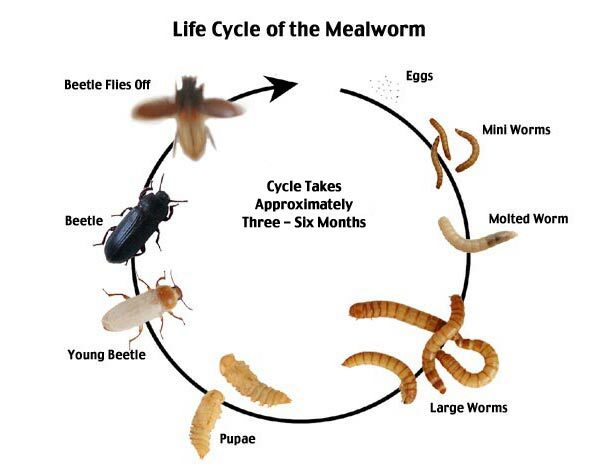 The next picture shows the life cycle of the yellow mealworm. This picture shows the difference in size of the yellow mealworm and the buffalo worm. What is also very interesting about the buffalo worm is that it has a shorter life cycle than Tenebrio molitor, the yellow mealworm. The buffalo worm can finish its life cycle in one month under optimal conditions while the yellow mealworm needs over two months to become an adult. Female beetles of the buffalo worm can lay between 200 to 400 eggs. In one source from the literature, it is written that the female beetles of the buffalo worm can lay up to 2000 eggs, it is an extremely large amount of eggs to lay for such a small beetle. The optimum temperature for the yellow mealworm is between 25-27 °C. In another research paper, it states that the optimum temperature for growth is 31 °C for both species. Findings in the literature vary but it seems that the buffalo worm prefers the environment to be a little bit warmer. The optimum relative humidity is 70% for both species, but this value varies in scientific papers. Unlike the yellow mealworm, (T. molitor), larvae of the buffalo mealworm (A. diaperinus) are more susceptible when it comes to pupation. Either they need more substrate in vertical direction or some cardboard pieces which they can use for pupation. Depending on the amount of space given, only a certain amount will pupate. In comparison to the yellow mealworm, (T. molitor), buffalo worm (A. diaperinus) has a softer skin (exoskeleton) and the taste of the yellow mealworm (T. molitor) is a bit spicy, while the buffalo worm (A. diaperinus) tastes a little bit nutty. Both species are used as food and feed, but the use of feed is more predominant. Overall, the buffalo worm is slightly more susceptible in pupation and the breeding is more difficult than the yellow mealworm. Therefore, we and many people at home have chosen the yellow mealworm for rearing rather than the buffalo worm. Canadian Grain Comission (2013): Yellow mealworm Tenebrio molitor L.. URL: https://www.grainscanada.gc.ca/storage-entrepose/sip-irs/ymw-tm-eng.htm [2018.07.03]. Dahl Bjørge, J.; Overgaard, J.; Malte, H.; Gianotten, N.; Lars-Henrik Heckmann, L.-H. (2018): Role of temperature on growth and metabolic rate in the tenebrionid beetles Alphitobius diaperinus and Tenebrio molitor. Journal of Insect Physiology 107, 89-96. (Panzer) (Insecta: Coleoptera: Tenebrionidae). UF/IFAS Extension, EENY-367. Felke, M. (s.a.): Glänzendschwarzer Getreideschimmelkäfer (Alphitobius diaperinus). URL: http://www.schaedlingskunde.de/Steckbriefe/htm_Seiten/Glaenzendschwarzer-Getreideschimmelkaefer-Alphitobius-diaperinus.htm [2018.07.03]. N. N. (2012): Alphitobius diaperinus AKA "Lesser Mealworms". 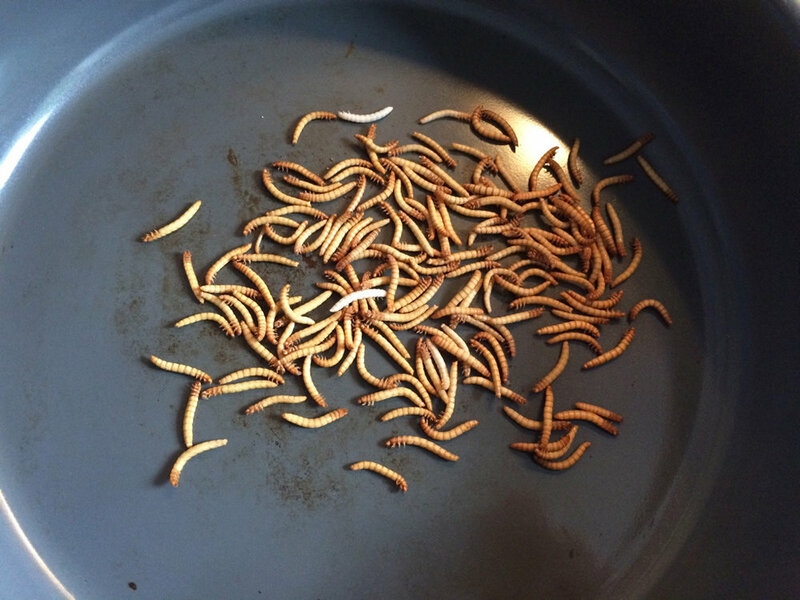 URL: https://www.chameleonforums.com/blogs/alphitobius-diaperinus-aka-lesser-mealworms.580/ [2018.07.03]. N. N. (2018 a): Tenebrio Molitor Basic Facts URL: https://github.com/TinyFarms/OpenBugFarm/wiki/Tenebrio-Molitor-Basic-Facts [2018.07.03]. N. N. (s.a. a): Mehlkäfer: Steckbrief, Entwicklung und Bekämpfung mittels Fallen. URL: https://www.hausgarten.net/gartenpflege/schaedlinge-krankheiten/mehlkaefer.html [2018.07.03.]. 1Mealwormcare (2018): Life cicle. URL: mealwormcare.org/life-cycle/[2018.07.03]. Diaperinus. Journal of Applied Entomology 133, 67-72. 2Rueda, M. L. and Axtell, R. C. (1996): Temperature-dependant development and survival of the lesser mealworm, Alphitobius diaperinus. Medical and Veterinary Entomology 10, 80-86. Siemianowska, E.; Kosewska, A.; Aljewicz, M.; Skibniewska, K. A.; Polak-Juszczak, L.; Jarocki, A.; Jędras, M. (2013): Larvae of mealworm (Tenebrio molitor L.) as European novel food. Agricultural Sciences 4/6, 287-291. Want to make a healthy and delicious meal but you are running out of time? Don't worry you can try to prepare the Silky Chinese Steamed Egg with a touch of insect. You can make it using some very simple ingredients that you could find it in your own kitchen! Plus the meal only takes you 20 minutes to prepare. Freeze 50 grams of fresh mealworms for 2 hours and then pour 500 ml of water in a small/medium sized pot and boil the water until bubbling. Pour the frozen mealworms into the boiling water and boil it for 1 minute. Take out the mealworms when it is finished and then drain and wash the mealworms with water. Then set the mealworms aside in a bowl. Preheat oven to 200 °F or 93 °C and then put the laminate paper on every tray. Pour all mealworms evenly on even try and coat the mealworms with olive oil. You can then add a dash of salt on the mealworms. After the oven is heated to the selected temperature, put it in the oven tray and bake it for 1-2 hours until they are dry and crispy. Take our the tray as well as the mealworms and put it into the blender for 10 seconds and until it powders to the texture that your prefer. Prepare a large bowl and beat the egg finely. Then place it in a filter on your container; pour the egg liquid. Let the liquid drop into the container slowly. Pour all the prepared mealworms evenly throughout the container. You can add salt and pour water slowly and stir the liquid in one direction. Put the containers aside for around 5 minutes to remove any bubble inside and then cover them. Set up the steamer, bring the water for boiling and slow down the fire to simmer for 8-12 minutes depending on the size of your container. (For the time, please see note 1.) Then you can remove it from the fire and wait for 2 minutes to cool down. Transfer the containers out and pour some sesame oil on each and garnish chopped spring onion on top. Finally you can enjoy the steamed egg with mealworms! Note1: the steamed time of the egg custard should be adjusted according to your container to the height of the custard. For example, if you are using a wide deep plate, then only 7 to 8 minutes are needed.